Data. At first we had too little. We asked for more and we got it. Now we have more than we want. Data lead to information, but what we were looking in the first place was knowledge . Big Data together with Cloud Computing are two of the popular buzz words. 'Big Data', to keep it simple, generally describes voluminous amount of diverse structured, semi-structured and unstructured data that has the potential to be mined for information and knowledge enabling enhanced insight and decision making (business intelligence). Sensor technology, wearable computing, and the Internet of Things (IoT) create a substantial amount of new data that will enable near-real-time decision systems. With plenty of data available, it is a matter of making sense of it or, in other words, to elicit actionable knowledge for improving organizations' performance. A set of command and control systems that monitor the efficiency and effectiveness of that value creation process. The challenge, for an organization whose strategy requires effective participation in knowledge-intensive sectors of the global economy, consists in building an organization able to manage efficiently and effectively these four aspects where value is represented by knowledge. It is not easy to define the term "knowledge" as it has different meanings depending on context. In the context of the business enterprise or the personal computer user, knowledge tends to connote possession of experienced "know-how" as well as possession of factual information or where to get it. In philosophy, the theory of knowledge is called epistemology and deals with such questions as how much knowledge comes from experience or from innate reasoning ability; whether knowledge needs to be believed or can simply be used; and how knowledge changes as new ideas about the same set of facts arise. It is common to think at the current post-industrial global economy as an information-intensive environment. More remarkable is the high number of assertions that knowledge is the key of effective competition, marketplace distinction and profitability . But which is the distinction between data, information and knowledge? The question can be answered in several different ways, here is one possible answer. Figure 1 - The transformation of data into information through the five "Cs". Figure 2 - The transformation of information into knowledge through the four "Cs". Is a fluid mix of framed experience, values, contextual information, and expert insight that provides a framework for evaluating and incorporating new experiences and information. It originates and is applied in the mind of knowers. In organizations, it often becomes embedded not only in documents or repositories but also in organizational routines, processes, practices and norms. Davenport and Prusak asserted that data become information when its creator adds meaning through different possible methods: contextualized (defined with a given purpose), categorized, calculated (mathematically or statistically), corrected and condensed (summarized). Computers and technology may foster the process but they hardly solve the problem of contexts, categories and summaries without human help. Humans carry out also the knowledge-creating activities directed to transform information into knowledge through different methods: comparison, consequences, connections and conversation. The given knowledge definition is strictly connected to humans who are able to collect experiences, have belief, feelings, values and motivations. Knowledge is intuitive and exists within people, part and parcel of human complexity and unpredictability. Therefore knowledge is hard to capture in words or understand completely in logical terms . The definition specifies also the function or purpose of knowledge: knowledge is a framework for "evaluating and incorporating new experiences and information". This is the basis for a process which continues along time. This knowledge definition is in contrast with philosophical knowledge which is directed to discover the absolute truth (with the limit of the language that is not considered capable to express it) and with scientific knowledge which tends to discover general laws (through the experimental method). Demarest asserted that the goal of what he called "commercial knowledge" is not the truth in general, but effective performance: "what works" or even "what works better", where better is defined in competitive and financial contexts . In the same way, knowledge as been defined by Nonaka and Takeuchi  as "justified true belief". Knowledge is provisional and partial, strictly dependent from the context that can rapidly change, it is not truth but appropriateness, capability of adaptation in a mutable and not completely defined environment. Knowledge Management is the name given to a set of systematic and disciplined actions that an organization can take to obtain the greatest value from the knowledge over which it disposes . In other words it consists of processes to capture, distribute, and effectively use knowledge. Knowledge acquisition: The process of development and creation of insights, skills, and relationships. Knowledge formalization tools are examples of direct knowledge acquisition. Data capture tools with filtering abilities, intelligent databases, note-capture tools, and electronic whiteboards are examples of information technology components that can support indirectly knowledge data acquisition. Knowledge sharing: Disseminating and making available what is already known. A decision support system that provides a novice physician best clinical practice is an example of knowledge that is being shared with that clinical agent. Possibly, the sharing process has to be optimized on the specific context. Knowledge utilization: Learning is integrated into the organization. Whaever is broadly available throughout the company can be generalized and applied, at least in part, to new situations. Figure 3 - The three fundamental processes of knowledge management according to Amrit. Amrit  listed typical technology tools able to support each stage (see figure 3). Ideally, knowledge management tools, should support a continuous process enabling users, who are utilizing the system for accomplishing their processes, to add, in the same time, new knowledge and share it. Figure 4 - The process supported by knowledge management tools. Keep in mind, KM is about process, not about digital networks or smart intranets, the management of knowledge has to support and improve the business process. Technology is only an enabler which is strongly dependent from the organization context. In the area of knowledge management, a large part of knowledge is not explicit but tacit. Following Polanyi’s  epistemological investigation, tacit knowledge is characterized by the fact that it is personal, context specific, and therefore hard to formalize and communicate. Explicit, on the other hand, is the knowledge that is transmittable through any systematic language. Polanyi contends that human beings acquire knowledge by actively creating and organizing their own experiences. Thus, explicit knowledge represents only the tip of the iceberg of the entire body of knowledge. In addition, Nonaka and Takeuchi  defined their dynamic model, called knowledge conversion process, on the assumption that human knowledge is created and expanded through social interaction between tacit and explicit knowledge. Effective KM requires a continuous knowledge conversion process. According to Nonaka and Takeuchi , and to the contextualization in the medical area provided by Stefanelli , it represents a social process between individuals and not confined within an individual. Externalization (tacit to explicit) is the process of conversion of tacit into explicit knowledge, for example the translation of a clinical trial result into a recommendation for clinical practice. Combination: (explicit to explicit) is the process of enriching the available explicit knowledge to produce new bodies of knowledge, for example combining medical and organizational knowledge into a decision support system. Internalization: (explicit to tacit) is the process of individual learning by repeatedly executing an activity applying some type of explicit knowledge, e.g. a CPG, and absorbing the relationship between actions and results as new personal tacit knowledge. 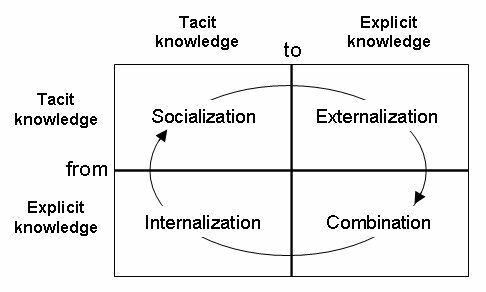 Socialization: (tacit to tacit) is the process of learning by sharing experiences that creates tacit knowledge as shared mental models and professional skills (e.g. apprentices learning process, or expert consensus achievement during medical meetings). Figure 5 - The knowledge conversion processes in a knowledge creating organization according to Nonaka and Takeuchi . Tacit/explicit dimension is too general to be useful to managers trying to decide what knowledge transfer prectices would be more effective in their situation . Implicit rule-based knowledge it identifies knowledge that could be made explicit and codified if agents just have the time and inclination to do so. An example is when technicians are aware that the process explained in a manual is not the best way to complete a task. Implicit know-how it is knowledge that can be communicated but usually is not codified because of the contextual complexity involved... sometimes it is just a matter of the right questions in the right moment. It is strictly connected to expertise and t is really hard to articulate because it is so complex and situationally defined. Deep tacit knowledge it is the colletively shared beliefs, mental models and values that determine what individuals view as important and even what they define as relevant knowledge. It is the most difficult to acquire because it is usually transferred unconciously through a set of practices that are unique to every organization. Given the tacit/explicit conversion process, it is possible to assert that knowledge is social as produced and shared among a network of human and non-human actors within the organization. The mere existence of knowledge somewhere in the organization is of little benefit; it becomes useful only if it is accessible/sharable, and its value increases with the level of accessibility. This leads to the importance of communication/interaction (between humans and between humans and non-humans) as key factor for the success for a knowledge-intensive environment. Such relationships work on a mix of formal and informal channels not always easy to detect. The goal of Social Network Analysis (SNA) is to create a representation of the organization people relationships that can be used to improve organization performance. SNA is focused on discovering people's interaction patterns. Computer networks are inherently social networks, linking people, organizations, and knowledge . Communities, like computers, has become networked. Although community was once synonymous with densely knit, bounded neighborhood groups, it is now seen as a less bounded social network of relationships that provide sociability support, information, and a sense of belonging. Many organizations are similar to networked communities in having multiple sets of work team members, physically dispersed relationships, and teams of co-workers shifting by the day and week as employees get involved in multiple projects. It is well known that human agents communicate more easily with others of similar occupation and educational background, since they have similar experiences, beliefs, and knowledge . Furthermore, the more individuals communicate, the more similar they become . Whilst examining issues concerning direct communication between two human agents, this is quite obvious and the relevance of the communication process also in health care setups has been widely demonstrated . For instance, clinical experts often meet and discuss actual and past clinical cases. The cognitive notion of common ground is the key point in this context. It refers to the knowledge shared by two communicating agents  (e.g. the discussion of a medical problem with a medical colleague is really different from that with a patient). Pre-emptive grounding: agents share knowledge prior to a specific conversational task assuming that it will be needed in the future. Just in time grounding: agents share only specific task knowledge at the time they have a conversation. Thus, any given interaction between two agents involves costs born at the time of conversation, as well as costs born previously in pre-emptive groundings. When there is a mixture of human and computer agents, an information system designer has a spectrum of options (based on the above mentioned balancing) for designing the interaction among them. The previously mentioned interaction options could be considered for the development of an Information System. For a KM tool, interaction has to go a step further. In fact, in a traditional information system there is no separation between information level and knowledge level, and it is common that users adapt themselves to the system and, besides small customizations, never vice-versa. The model for interpretation of data is hardwired or, in the most advanced cases, based on simple categorizations. 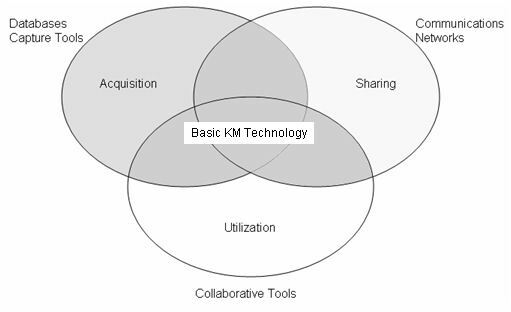 In contrast, KM tools treat humans (singularly or grouped in communities) as key components engaged in an active process of sense making to continuously assess the effectiveness of "best practices". Thus, in a KM tool, the human-computer interaction is more complex and will transfer not only information, but also the related meaning. Again, such meaning can be transferred from the user to the knowledge system through the chosen interaction modality and the resulting balancing between the two different types of grounding. For instance, if the user is obliged to define all the entities that will be used in interaction before starting the interaction process itself, we are talking about preemptive interaction process. The possibility of defining entities when used effectively or "after" their first usage can be considered a just in time grounding (knowledge reorganization). 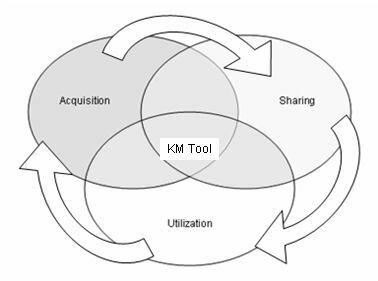 KM tools or better Knowledge Management Systems (KMS) are systems designed to manage the different types of knowledge belonging to an organization. "KMS are IT-based systems developed to support/enhance the processes of knowledge creation, storage/retrieval, transfer, and application" . 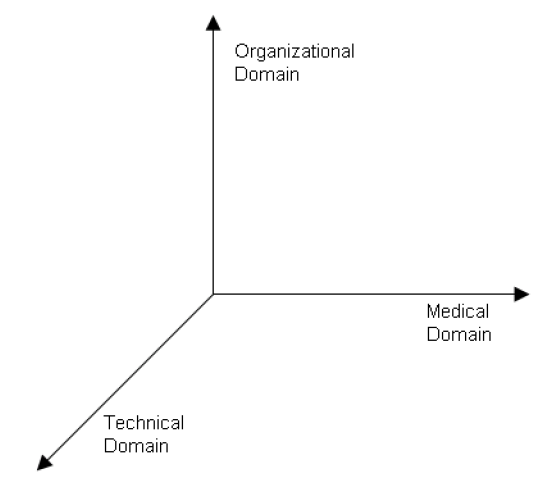 In this context, the ICT aspect represents the third dimension, that Van der Aalst defined as technical domain . Figure 6 - The three-dimensional knowledge domains space. Each domain should be integrated with any of the others in order to obtain the best possible result in patients’ care delivery. The above mentioned three domains must be integrated with each other to obtain the best possible results in patients’ care delivery. ICT systems should be developed in such a way to facilitate people communication and collaboration within an organization. Berg writes that “the work of medical personnel is rewritten in the light of the tool and vice versa” . This arises the already mentioned socio-technological issues related to common grounding and shared understanding. In someway, both medical and organizational domains refer to activities based on (at least partially) codified models and structures. But an effective KMS should not forget data. In front of structures, data are directly connected to the learning processes mentioned above. Rules, models, abstractions and categories arise in our minds after collecting information which come out form data, not before. This is why it's easier to learn a computer language from examples than from its theory, or a natural language by just being exposed to it instead of knowing all rules and exceptions. Data emergence can be defined as: “the incidental creation of personal information through the selfish pursuit of individual goals” . Data emergence enables the learning process fostering a set of steps that starting from data look for some sort of patterns that are not known a priori. In a HCO typical data are the patient data which include for instance genetic data which are not affected by ongoing processes. Figure 7 - The knowledge and data domains. While medical, organizational and technical domains are at least partially codified in knowledge models and structures, patient data can be under the form of information. Polanyi M. The tacit dimension. London, UK: Routledge & Kegan Paul, 1966. Stefanelli M. The socio-organizational age of artificial intelligence in medicine. Artificial Intelligence in Medicine, Issue 23, 25-47, 2001. Tang P, Jaworski MA, Fellencer CA, Kreider N, LaRosa MP, Marquardt WC. Clinical information activities in diverse ambulatory care practices. Proc AMIA Annu Fall Symp.1996:12–6. Clarke H, Brennan S. Grounding in communication. Resnick LB. Levine J, Behreno SD (eds). Perspectives on Socially Shared Cognition. Washington, DC: American Psychological Association, 1991 Tang P, Jaworski MA, Fellencer CA, Kreider N, LaRosa MP, Marquardt WC. Alavi, M. and D.E. Leidner. Review: Knowledge Management and Knowledge Management Systems: Conceptual Foundations and Research Issues. MIS Quarterly, Volume 25, Number 1, pp. 107-136, 2001. Institute of Medicine. Crossing the quality Chasm. Washington, D.C.: National Academy Press, 2001. Van der Aalst WMP. Three good reasons for using Petri-Net-based workflow management system. Information and process integration in enterprises: rethinking documents. Boston, MA, USA: Kluwer Academic Publishers, 1998, pp. 161-182. Berg M. Rationalizing medial work-decision support techniques and medical practices. Cambridge, MA, USA, MIT Press, 1997.